by Knudson, Duane V., Morrison, Craig S.
Knudson, Duane V., Morrison, Craig S.
Continuing in the steps of the first edition, >Qualitative Analysis of Human Movement, Second Edition,> integrates the perspectives of the major subdisciplines of kinesiology-making it the only available textbook entirely devoted to qualitative analysis. 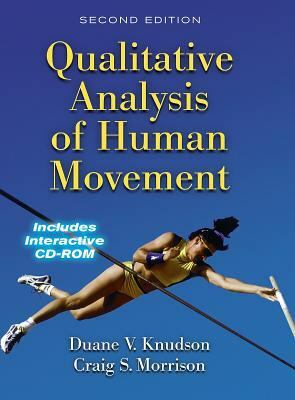 It has been thoroughly revised and updated and includes over 50 new references and even more examples of the application of qualitative analysis.Duane Knudson and Craig Morrison use a four-step model to thoroughly cover qualitative analysis in theory and history in >Qualitative Analysis of Human Movement, Second Edition.> Using an interdisciplinary approach, the authors lead readers through the practical applications of their model, supplementing each chapter of the text with an interactive CD-ROM that illustrates the qualitative analysis process with exercises and video clips.Integrated into each chapter, the CD-ROM contains video clips to illustrate important points. The CD-ROM enhances student learning by showing video clips and then presenting a series of questions that guide readers through the process of qualitative analysis.The comprehensive yet practical nature of this second edition of >Qualitative Analysis of Human Movement> makes it an essential text and reference for students and professionals in all fields of human movement. Readers will benefit from the authors' interdisciplinary approach, and guided examples of the qualitative analysis process deftly illustrate how to blend practical experience with theoretical sport science to improve human movement.Part I, "An Integrated Approach to Qualitative Analysis, " explains the importance of taking a multidisciplinary approach to qualitative analysis, summarizing the authors' four-step model for helping people move better: preparation, observation, evaluation/diagnosis, and intervention.Part II, "Four Tasks of an Integrated Qualitative Analysis, " covers each of the four steps of QA in depth, allowing readers to expertly apply the model in everyday practice.Part III, "Practical Applications of Qualitative Analysis, " gives readers numerous real-life examples and hypothetical practice situations to help them better understand the qualitative analysis process.Students and professionals alike will benefit from the text's integrated approach which explains how the kinesiology subdisciplines of biomechanics, motor learning, pedagogy, and motor development contribute to the field of qualitative analysis. The text also explains how each subdiscipline is important in qualitatively analyzing human movement.CD-ROM Minimum System Requirements>System Compatibility>--IBM PC compatible with Pentium processor or higher-Windows 95/98/NT 4.0; Windows 2000, Windows ME>Hardware Needs>--32 MB RAM recommended-2x CD-ROM drive-16-bit monitor recommended-At least 640 x 480 screen resolution-Sound card and speakersKnudson, Duane V. is the author of 'Qualitative Analysis of Human Movement', published 2002 under ISBN 9780736034623 and ISBN 0736034625.